Survival Preparedness Bag with a FOX Tactical Field Operator’s Action Pack has you covered for 72 hours with food, water, warmth, first-aid and safety. 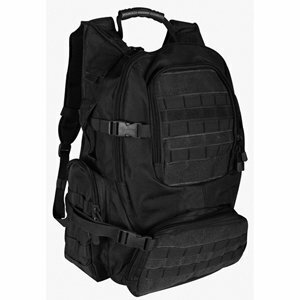 The Survival Preparedness bag includes: BAG-FOX Tactical Field Operator’s Action Pack (Black) constructed of rugged tactical polyester, three compartment configuration with large bottom pocket and two side pockets, padded & ventilated back panel with zippered side-entry suitable for a laptop computer, modular attachment points, electronic-zippered accessory pocket, padded & adjustable shoulder straps, padded & removable kidney belt; molded top carry handle & 2 side web handles, size: 22″ x 16″ x 9″. FOOD/WATER: Two 2400 Calorie Food Bar Packets by SOS Food Lab-Made in USA/U.S. Coast Guard Approved, packet contains six fortified bars (400 calories each); Two MREs ready to eat meals by MRE Star w/ flameless heaters-Made in USA; Eighteen 4.22 oz drinking water packets by SOS Food Lab-Made in USA/U.S. Coast Guard Approved. SURVIVAL & FIRST AID KIT: Adventure Medical Kits SOL Hybrid 3-covers all the bases of outdoor safety: medical supplies, survival tools, and gear repair items ensure that you and your equipment make it back in one piece. PARACORD-100 feet of Gladding #550 paracord-Black-contains 7 removable inner strands, is made in the USA, is ultra-strong & will not rot. Gladding is one of the suppliers of the U.S. Department of Defense. SHELTER/WARMTH/FIRE: One two-person Tube Tent; One Emergency Poncho; One Emergency Blanket; One Coghlan’s 36-Hour Survival Candle w/ matches; One package Coghlan’s Wind/Waterproof Storm Matches; Two packages Coghlan’s Waterproof Matches; One Magnesium Fire Starter with Striker; SANITATION/HYGIENE: Three (3) N95 Particulate Respirator Mask; One toothbrush & toothpaste; One toilet paper; one package tissue; One package Shower-in-a-Bag (8 cloths); Six wet naps. We reserve the right to add or substitute items of equal or greater value.